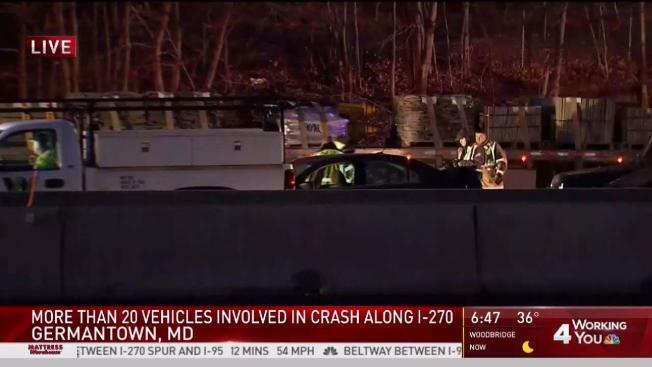 Maryland State Police are searching for a tractor-trailer that cut off a car, setting off a chain-reaction crash on Interstate 270 that involved nearly 20 vehicles. The white tractor-trailer was traveling along I-270 southbound in Germantown, Maryland, at 5:20 a.m. when it abruptly changed lanes, cutting off a car. That car started a chain-reaction crash that involved 18 vehicles, including a tractor-trailer that lost its load of slate. Some of the vehicles behind the tractor-trailer were not able to avoid the slate, Montgomery County Fire and Rescue Service spokesman Pete Piringer said. The tractor-trailer that caused the crash stopped briefly, but then continued driving. Two dozen people were evaluated, but only four were taken to the hospital. Two people were seriously injured, but their injuries were not life-threatening, Piringer said. All southbound lanes of I-270 were closed for two hours, but the road has since re-opened. Delays remain in the area. Anyone with information that can help police is asked to call 301-424-2101.